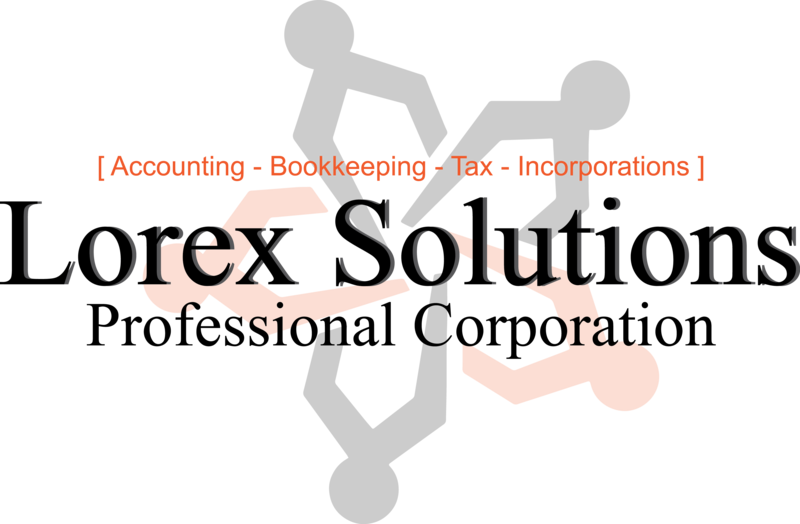 Why should I come to Lorex Solutions for bookkeeping when I can do it personally? We will set up an efficient system and take full charge of your bookkeeping in order to monitor all transactions, which will allow our firm to maximize results on the year end tax return for your business. What is required from us if we are months behind with our bookkeeping? We ask for you to provide all your receipts, expenses, sales invoices/register readings, bank statements, cheques issued, payroll information and previous pay cheques issued. We have a convenient drop off location with free parking and/or electronic uploading of documents. What do we provide on a monthly basis to maintain an efficient bookkeeping system? We require all your receipts/invoices, sales, cheque stubs and bank statements. It is important to keep ALL copies of receipts and invoices on expenses. How can I confirm or guarantee all my expenses are accounted for? With our attention to detail, we guarantee the completion of all documents with high accuracy and run bank and/or credit card reconciliations on a monthly basis to ensure all expenses are captured. What should I pay myself and in what form? We provide this advice to all our clients. After analyzing your company, your personal income situation and other factors, we will advise of the best method and most beneficial pay structure. Should I incorporate or continue operating as a sole proprietorship/partnership for tax purposes? Please consult us so we can analyze your business and provide a report for what structure we believe is most desirable for your current situation and future outlook. How can I understand financial statements? We will breakdown the details to ensure you understand the statements in order to obtain all necessary information. What benefits will these financial statements provide to me as a business owner? We will advise and analyze the statements to point out what information each statement is projecting to you, as an owner. What if we own multiple businesses and/or departments and we want each to be separated for the income statement? We have the capabilities to split these businesses and/or departments into separate sectors. We will provide all necessary information to project the performance of each business/department, as separate entities. If I require financing, bank loan and/or a future investor, how can Lorex Solutions assist with preparation of the financial statements? We will review all the work necessary to ensure quality and prepare all required financial statements including profit &#038; loss, balance sheet, cash flow and shareholders net worth/equity. We complete all necessary work in a timely manner in order to meet the requirements of financial institutions and all other stakeholders. What information is required in order to incorporate my business? Please bring a list of proposed names for the business, information of each director (legal names, address, position), address to be registered, corporate structure, class of shares and amount of shares and the province/territory of registration. If you are unsure of some of the information required, we are always available to answer these questions during the consultation. What structure is best when incorporating? Please book an appointment to discuss this matter as details differ from industry to industry and preferences differ from director to director. What do I need in order to complete a Nuans name search? A list of all proposed names to search across the Canadian database to ensure and guarantee the proposed name is not being used. What if I want to use my registered sole proprietorship name for my corporation, is this possible? Yes, this is possible. Please consult us and we will set up all required documents to make this happen. What information do I need to trademark a logo, company name, etc.? Please bring legal name of the business, name of directors, legal address of business, industry and revenue activity of the business and the company name and/or logo to be trademarked. Note, for trademarking a logo, an electronic copy in “.tiff” format less than 1mb is required. What documents do we need in order to have income taxes, business taxes and corporate t2 taxes completed? Please consult our services page for a detailed listing of all documents we will require. How long will it take to complete my personal tax return? If you wish to drop by and have it done on the spot, it can take 20 minutes or more, depending on the situation of the individual. If documents are uploaded or emailed, we will finish them within 12-24 hours, maybe sooner. We guarantee maximum results in the returns we complete. How long will it take to complete my Corporate T2? This depends on the size and review your company requires. Generally, we aim to finish in at least 5 business days. Please contact us for a more accurate result. What is required to ensure I do not get audited on my corporate taxes? There are many factors that come into play to ensure your records are up to CRA standards. The most important one is to possess all expenses, sales and agreements. For a more in depth overview, please contact us to set up a consultation.